I seem to have done a fair amount of eating and not a lot of exercise since starting this project – not very New Yorker of me. So to ease me back into the new year after a gluttonous holiday season, I signed up for a Gyrotonics class at the SoHo Living Room. The machine looked horrifyingly like something a gynecologist might use. But my instructor Jennifer had the most soothing voice and kept caressing me as I did the moves wrong, and then there was this gentle music playing and vases of dried roses and the way they smiled at me made me feel LIKE I MATTERED… so I got over the horror pretty quickly. When we got going, I learned that it’s sort of like yoga in motion. Jennifer led us through stretches and movements on seats before we applied them to the machine. 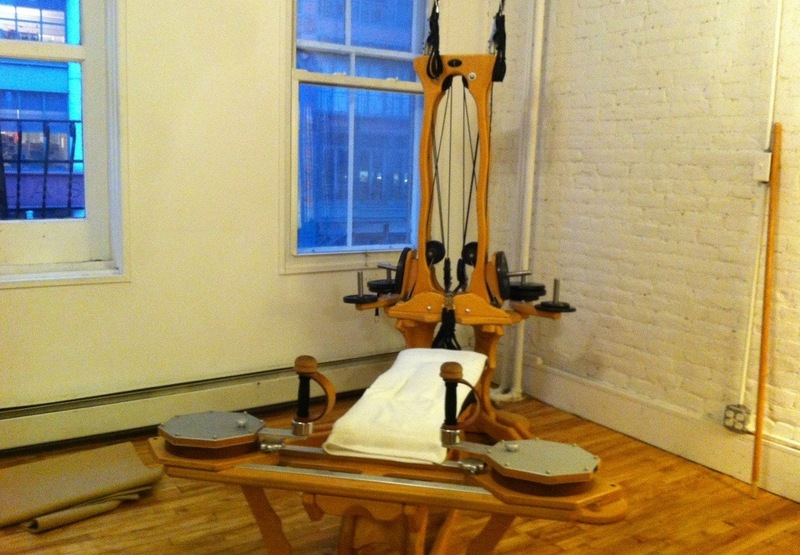 Once sitting on the bench, we leaned into two large wheels with handles to rotate them – arching and relaxing our spines – and hooked our feet into foot holds so we could do leg stretches with the resistance of weights (not so much like a gyno’s stirrups after all). I realised just how uncoordinated I am and also feared I’d do a backwards roll because of the weights pulling on my feet, but it was fun and relaxing – and I was getting that satisfying spine crack the whole time. Who knows what good it was actually doing me (when I asked, Jennifer said something about ‘centralizing’ and used the word ‘core’ a lot) but I can imagine the benefits are similar to those in yoga or Pilates. I’d definitely sign up for more… If I wasn’t busy every day for the rest of the year. When I saw the title, I thought it meant you tried a new kind of gin and tonic. Perhaps we should create one.